Squirrel Seeks Chipmunk by David Sedaris is next up on our 100 Bestsellers List reading challenge. The full title of this book is Squirrel Seeks Chipmunk, A Modest Bestiary. Bestiaries, a collection of stories using anthropomorphic animals to deliver moral or religious lessons, were a popular literary format in the Middle Ages. Interestingly, the title used for UK publication is Squirrel Seeks Chipmunk, A Wicked Bestiary. I wonder why the publishers thought “modest” would sell better in the US than “wicked.” Personally, I think wicked describes these stories much more aptly than modest. In August we read The Art of Racing in the Rain by Garth Stein, which featured a dog, Enzo, as the main character. As I mentioned in my review, I really liked The Art of Racing in the Rain and the fact that we were inside the mind of a dog, reliving his story from his viewpoint, worked for me. I cared about Enzo and really hoped he would achieve his goal of being reincarnated as a race car driver. But throughout the book, Enzo was a dog, with all the limitations of a dog. He couldn’t actually speak to humans, he couldn’t act in any way that was outside the norms of being a dog. She’d then describe how he slept at the foot of her bed and woke her each morning with a kiss. Um, I’m sorry, but snakes can’t kiss. Also, if the animals in these stories are able to talk and act like humans, why are not ALL of the animals doing so? In this same story, the mouse tries to teach the snake to talk. Eventually she saw the chauvinism of her attempt. Why should he learn to speak like a rodent. Why not the other way around? Hence she made it her business to try and master snake. After weeks of getting nowhere she split her tongue with a razor. This didn’t make it any easier to communicate, but it did give them something else in common. In all the other stories, the animals just magically understand each other. Squirrels talk to chipmunks. Owls talk to hippos. Cows talk to turkeys. There’s no mention of learning another language – they just all understand each other. But not in this story. I read the hardcover copy of this book and on the back of the jacket there are several short blurbs from other reviewers mentioning how much this book made them laugh, or how funny they found it to be. I failed to find any humor at all. It’s bizarre, it’s dark, it’s strange, it’s horrifying, but funny it is not. There was more than one story where I simply had to put the book down and not read anymore due to the horrific ending. Yes, these stories illuminate the oddities and inconsistencies of humans and human interaction, point out the hypocrisy and pretenses that we all have, but does that make them worth reading? For me, it did not. More often than not, Sedaris’s intended messages were lost on me. If anyone can explain the meaning behind the last story, “The Grieving Owl,” I’d be happy to hear it. The bigger question is, why did the computer algorithm pick this particular book to include on it’s list of 100 Bestsellers. I can see how faithful readers of David Sedaris might have made it a bestseller by purchasing the book when it was first published simply because they loved his other books. But why did the computer pick it over so many other bestsellers? After all, we’re not reading and reviewing all of these books just for the fun of it. These are books specifically chosen by the computer algorithm mentioned in The Bestseller Code, Anatomy of the Blockbuster Novel. So what did the computer algorithm see that I did not? But perhaps the most interesting similarity between Grisham and Steel is that their to-shared topic also happens to be the topic our model found most useful in identifying bestsellers. It is the topic that is most overrepresented in bestselling books when compared to non-bestsellers, and thus it has considerable predictive power…. It is more specifically about human closeness and human connection. Scenes that display this most important indicator of bestselling are all about people communicating in moments of shared intimacy, shared chemistry, and shared bonds. Perhaps it is fair to speculate that the portion of the American public that actually reads fiction likes to read more or less about itself. The stories in Squirrel Seeks Chipmunk are 100% about human connection, shared intimacy, and shared bonds. Perhaps the computer algorithm was better able than I to overlook the inconsistencies of animals doing human things and simply see the stories as human stories. Flawed humans, but humans all the same. What did you think of Squirrel Seeks Chipmunk? If you’ve read any of David Sedaris’s other books, how would you rate this one compared to those? 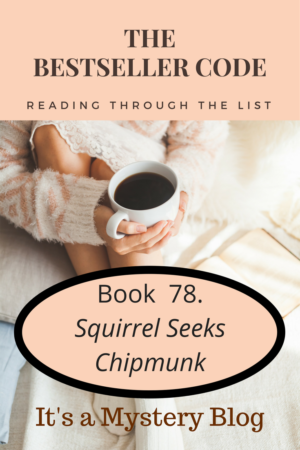 Squirrel Seeks Chipmunk by David Sedaris is a bit different from the other books we’ve read so far for The Bestseller Code 100 Challenge. For that reason, this review is also going to be a change of pace. Summary: This small book is a collection of short, fable-like stories featuring anthropomorphic animals. Regardless of the format, these are most definitely not tales for children. Rather than reviewing every short story in the book, I thought I’d pick out one and delve into it more deeply. Number six out of a total of sixteen stories, this fable featured a mouse who kept a baby corn snake as a pet. She adopted the snake when she saw it hatching from an egg. Over time, the mouse became extremely attached to it, even to the point where she began to shun other relationships. She justified bringing home baby toads for it to eat, and lied about the mole she’d captured. One day a mother toad and mother mole stopped by looking for their offspring, but no one answered the door. Just as well, because the snake had eaten its mouse benefactor and would have eaten the two of them as well if it had the opportunity. Like most of the short stories in the book, this one has a dark edginess. Bad things happen. It may be that Sedaris choose to feature animals as characters to give some distance and perspective to the events, but they are still hard to swallow (sorry). Each of these stories has layers of meaning. For example, we could interpret the love of the mouse for the snake to represent a bad relationship, when we love people who aren’t good for us. These unhealthy relationships can make us do terrible things and aren’t likely to end well. You could also interpret the snake to mean a destructive habit, like drug use or alcoholism. Drug or alcohol abuse can make a person do things they wouldn’t normally do, and the addict can’t always see the harm of their actions. Sometimes the addiction (snake) wins. Although it isn’t a pleasant book to read, Squirrel Seeks Chipmunk is complex and at times profound. Each story is short and quick, but the collection is likely to stay with you long after you finish. Have you read Squirrel Seeks Chipmunk by David Sedaris? We’d love to hear your thoughts. Time to start the discussion of our next novel from The Bestseller Code 100 list, Squirrel Seeks Chipmunk by David Sedaris. Summary: This small book is a collection of short, fable-like stories featuring anthropomorphic animals. Note: Regardless of the format, these are not stories for children. If you’re curious, NPR has a review with an excerpt. Have you written about Squirrel Seeks Chipmunk by David Sedaris? Feel free to add a link to your review in the comments. Today we’re looking forward to starting the next book in The Bestseller Code 100 challenge, Squirrel Seeks Chipmunk by David Sedaris for Book Beginnings on Fridays. The cat had a party to attend, and went to the baboon to get herself groomed. David Sedaris’s insights are sometimes coarse and sometimes wry. I have read Let’s Explore Diabetes With Owls, which is one of his more typical collections of personal short stories/essays. The reviews are all over for Squirrel Seeks Chipmunk. Do you think that perhaps at least in part that is because it is so different from his other works? Are you a David Sedaris fan? Have you read this book?